The actual location of origin of the carrot is somewhat of a mystery; however, most wild carrot varieties still exist in abundance in the regions around Iran or Afghanistan, which leads many to believe this is its birthplace. What we do know is that the carrot has been cultivated for many thousands of years. Anciently the carrot was grown for the aroma and taste of the greens, not the root. There are many of these carrot relatives still grown today like parsley, fennel, dill and cumin. 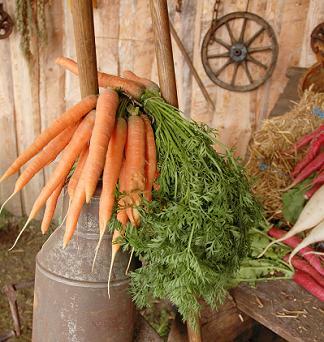 Selective breeding has occurred over the centuries to produce the carrot we now grow in our gardens. There are many colors of carrots, but the most commonly grown in the United States is orange. There are purple, yellow, white and red varieties. The orange comes from carotenes, which turns into vitamin A when digested. Purple is most likely the roots color. The carrot is an anciently eaten and cultivated plant, and is good eaten cooked or raw. It stores well during the winter. It is also easy to harvest up to 9 months of the year, if planted in succession. With a taste as sweet as the carrot, it is one of the finest vegetables there are. Carrots do well when planted with other vegetables that will give shade to the soil. They are great for filling in spaces too small for other plants along the edges of beds or grow boxes. But, they can also be planted rows. As with many true vegetables, it is best to sow carrots in succession to have a continuous harvest throughout the growing season. Sow seeds directly outdoors 4 weeks before last frost or when the soil can be worked, and continue to sow every few weeks until the full summer heat. Dig a trench ¼ inch (.6 cm) deep and sprinkle seeds at no particular distance apart. As the carrots grow, thin the plants in 3 to 4 stages until they are about 2 inches (5 cm) apart. Moisten the soil first, and then pull the carrot from the base of the stems straight up. You can eat the more matured, thinned carrots. Carrots are ready for harvest at any time, and bigger are not necessarily better. Carrots are very sweet when they are young, but not too small; however, they store better if they are more mature. It is best to eat the smaller ones as you thin them, and at the end of the growing season, harvest the rest to store. When the soil is loose and somewhat moist, mature carrots can simply be pulled from the ground, but most of the time you will need to loosen the soil around the roots with a garden fork. Clean them well by brushing off as much dirt as you can and cut the tops off right above the top of the carrot or about 1” (2.5 cm). If you leave the tops on too long, they will draw out moisture from the carrot and make the carrot go limp. Carrots that you plan to eat soon can be stored in the refrigerator. If you need to store them longer, you can bury the roots in a box of dry sand or sawdust and place them in a cool, dry room. Store only those carrots that have a good shape and are not damaged. Check stored carrots often and discard of any that are showing signs of spoilage. They will remain fresh and taste sweet until spring, or around 5 months after storing. Freezing them is also a good option. Simply wash them well and remove the tops. They can be sliced into rounds, cut into sticks, or shaved. Place the carrots into a freezer bag, making sure to press all the air out before sealing. Blanch the bags in boiling water for 8 to 10 minutes and let cool before placing them in the freezer. Carrots will last longer if placed in a deep freezer, but they can also be stored in an upright freezer for about 4 months.